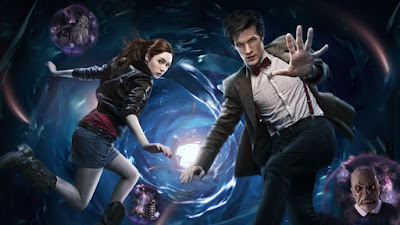 Saturday April 3rd, 2010.... a day that heralded the start of a new era for the long-running BBC sci-fi series Doctor Who. The highly anticipated first episode of the new series, now starring Matt Smith in the title role aired tonight.... and was the first full episode to feature the 11th Doctor. I'm not going to post a review of the show.... I just want to say that Matt Smith is FANTASTIC as the Doctor, and is a worthy successor to the excellent David Tennant, who raised the show to whole new levels of popularity during his tenure as the 10th Doctor. This episode also introduces us to the ever-so-slightly attractive Karen Gillan... who excels in her performance as new companion Amy Pond. The 11th Doctor is here.... and the Tardis is in very good hands. Karen....ever so slightly attractive lol yeh translates to blinking stunning :-). Glad you like it though.